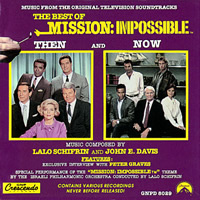 GNP Cresendo presents the original soundtrack to the classic 1960's and the 1987 Television series MISSION;IMPOSSIBLE. Features music by Lalo Schifrin and John E. Davis as well as an exclusive interview with Peter Graves (Phelps). From "Church Bells in Bogota"